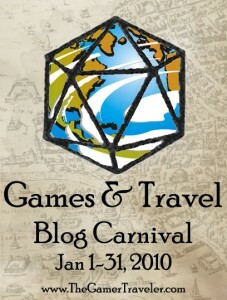 The Gamer Traveler is hosting this month’s blog carnival, Games & Travel. I don’t have much to say about travel within a game, except that sometimes the journey is more important than the destination. However, I do have a lot I can say about traveling as a gamer, because I have probably traveled more than the average gamer. As many of my readers know, I am a former Marine, having spent four honorable years in service to the United States (and another four on inactive reserve). During my enlistment I visited more than 40 major cities in more than 20 countries from Amsterdam to Tunis and from Sevilla to Manama. I was stationed in Southwest Asia (aka The Middle East) for more than a year and I also did a 6 month deployment in the Mediterranean, so I have had the pleasure of experiencing a diverse amount of culture. It was a grand adventure, in the way that real adventures are truly awful bouts of torturous events interrupted by short intermissions of cool and awesome. A lot of my time in service was in no way what most would consider fun, if they actually had to do it themselves. It is this reality of adventure that I experienced along my travels that has given me some important insight for my games. Most gamers never truly appreciate what we put our imaginary characters through. This is because we really don’t have anything at stake (besides needing to make a replacement character). This is a good thing; otherwise, roleplaying games wouldn’t be much fun. Believe me, combat (epic or not) and exploring dangerous locations is not fun, it’s horrific and terrifying and when you are done you are mentally and physically drained. The promise of riches might draw a few naïve adventurers once, but I bet 99.9% of them would retire after their first adventure. Which is why in most of the games I run, I try giving characters a motivation beyond untold riches. While I love the freedom of old school influenced sandbox style of exploring hexes, the reality of a sane individual exploring dangerous locations for the sake of exploring and amassing wealth is absurd to me. I also find that many gamers don’t fully comprehend what it is like when their characters must function in a strange locale where the inhabitants’ social mores, or customs, are vastly different from their own. Not to mention the communication barrier from not being able to speak the native language. Sure, many settings have given us an easy, if a bit unbelievable, way out through the Common tongue. English might be the closest thing we have in the real world to Common, but it is still very difficult to function abroad when that is the only language you know. Add to this that the average fantasy setting has not evolved like our own world has (with global conquests, technology, and widespread commerce), which led to English being so widespread. Though my travels have shown me that most gamers ignore (or don’t understand) that roleplaying games don’t truly reflect what adventure is really like, my experience has strengthened my appreciation for roleplaying games. How can that be? Well, roleplaying games are not meant to be adventure simulators. They are vehicles for the imagination that allow us to share experiences with our friends. They are games that encourage people to connect with each other. And my travels and experience has taught me that RPGs ability to facilitate these connections is very important. This right here is the perfect example of how travel influences games and what I was hoping someone would deliver. Thanks. .-= Daniel M. Perez´s last blog ..Ierne: The Raid =-. As a GM with travel experience, I usually try to leverage that to enrich my campaigns. I use maps and names from places I’ve visited. I transplant cuisine. I mentally record people I meet and make them NPCs. Logos become heraldry. Whatever I can draw details from to add flavor to the game. If you can’t afford to travel, check out a travel guide from the library about a country you’d like to visit. I don’t have any combat experience (unless you count competetive fencing, which is a reach, I admit) but many of my friends are vets. I know from them that, as you say, adventuring is a tough business. I try to convey the discomfort in the circumstances I describe and simulate the hardships with situational penalties. I think you can respectfully leverage experiences, both positive and negative, into your games. Nice perspective. Personally, I despise extended travel within games. All too often, it ends up with an overused plot hook like sinking a boat. Alternatively, its game days worth of sitting about waiting to arrive at the destination. Using culture shock and communication barriers is a great idea. Under utilized by far. .-= Mark´s last blog ..Gaming at 10,000 feet =-. @Daniel: Your welcome. I was hoping I could bring a unique perspective to the carnival. @Anarkeith: I agree, the experiences can definitely be leveraged to add details to the game; I just think that roleplaying games are not meant to be adventure simulators.